Andrew was a cousin of the influential Blair family in Washington. The Blairs were good personal friends with the Martin Family of "Martin's Point". The Martin family complex at Willowbrook was often the site of the summer vacation for the Blair children, and the Blairs in kind introduced the Martin children to Washington society. It was probably at the Blairs that Eveline Martin met Andrew Alexander. 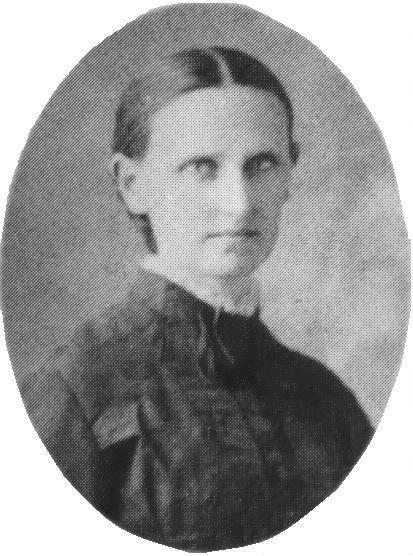 They were married November 3, 1864 at the Sand Beach Church in Fleming, NY. Andrew's service during the Civil War was outstanding. He received many promotions and assignment based on his leadership and tactics. He served under General Stoneman. Stoneman assigned him to a command under General Emory Upton, where he also met Colonel Miles Keogh. The three developed a close friendship, and following the war Upton and Keogh were often guests at Willowbrook. During the war, in 1862, Alexander was given a horse that had been raised by his Uncle, Mr. Blair. That horse, Black Sluggard, served faithfully with Alexander in many battles. The horse was such a prized war stallion, that Alexander lent him to General Stoneman on occasion. Stoneman would visit the horse with carrots and other treats. After two years of service and many war wounds, Alexander sent Black Sluggard to his Fiancee at Willowbrook. He was ridden around Willowbrook and often in to Auburn. The celebrated horse died in 1877 and was buried under the oak trees at Willowbrook. 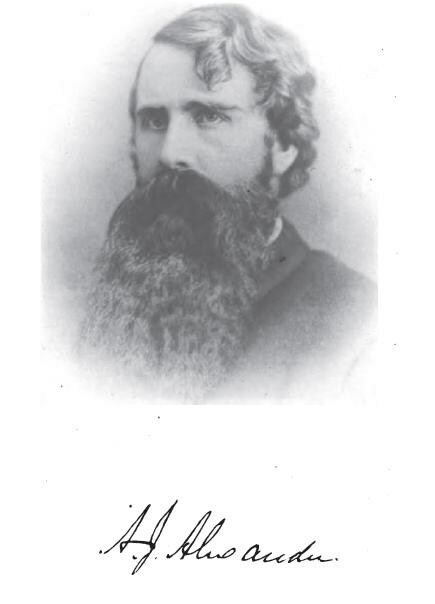 Alexander decided to continue his Army service after the Civil War and was assigned to various Army posts from Texas to Montana. He continued his exemplary service and was highly regarded by his superiors and his men. His wife Evy stayed by his side at these rustic outposts and thrived in this environment. For their leave, the couple would go back to Willowbrook for rest and relaxation. His bad health force him to retire from service in 1885. He had been in Atlantic City for his health, and was returning to Willowbrook, when his heath seriously deteriorated. With his wife by his side he breathed his last on a train was just outside of Utica. 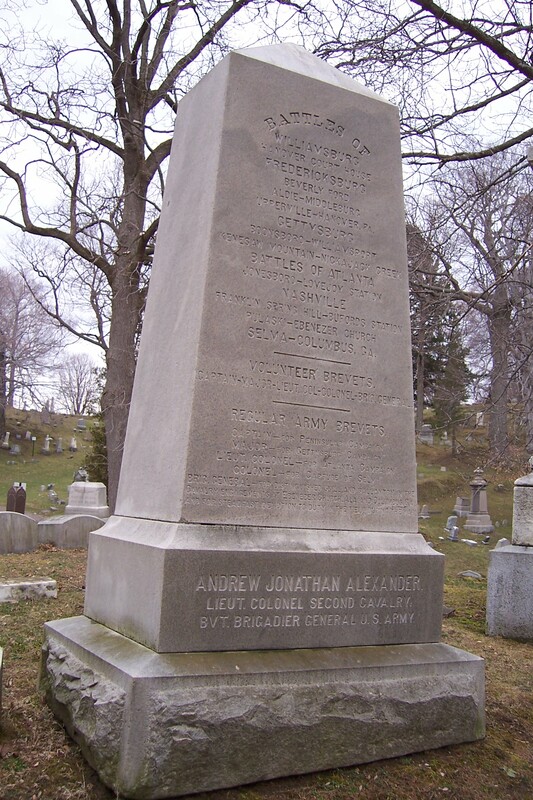 General Alexander is buried beside his wife in the Throop-Martin Family Plot in the Cemetery's Mount Hope section. 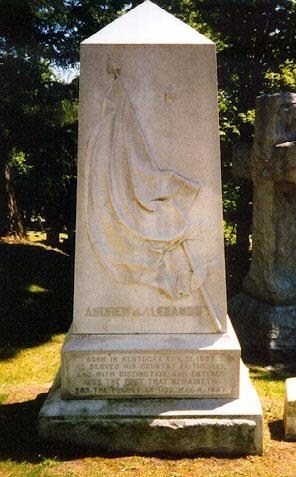 If you visit the gravesite, be sure to look at the back of his monument. It has an outline of his military service. His stead, Black Sluggard, is buried at Willowbrook, Martin's Point, Owasco.